It is important to have your electrical system inspected by a licensed electrical contractor. Having someone who is throughly trained in the electrical trade and familiar with the CODE is the best way to insure your system is safe and operating properly. From the service wiring and electrical panel to switches and plugs, having a qualified electrical contractor inspect your electrical system can give you confidence and peace of mind, and can reduce the risk of any potential hazards that may be present. If you have never had your electrical system inspected, you should. You will be glad you did! Remember anything not functioning properly in an electrical system has the potential to be a fire hazard!!! Set up an appointment to have your system inspected today. 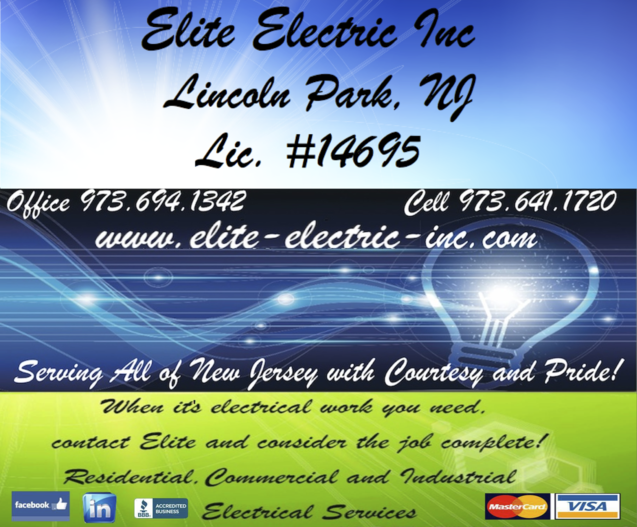 At Elite Electric Inc. we will provide you with the most thorough electrical system inspection possible! Even if you are only concerned with a single plug or switch, don't wait, call for an inspection! What may develop into a serious problem could be caught early and fixed easily!! The longer you wait, the better the chance of a serious problem developing!